Alongside this week's update, we're going to be launching content poll #49! This poll has a lot of interesting new pieces of content on offer, as well as the usual selection of quality of life updates. There is a wide array of jewellery in Old School RuneScape which uses gold, but very little which uses silver. In this week's Quality of Life poll we'll be offering an update to change that. 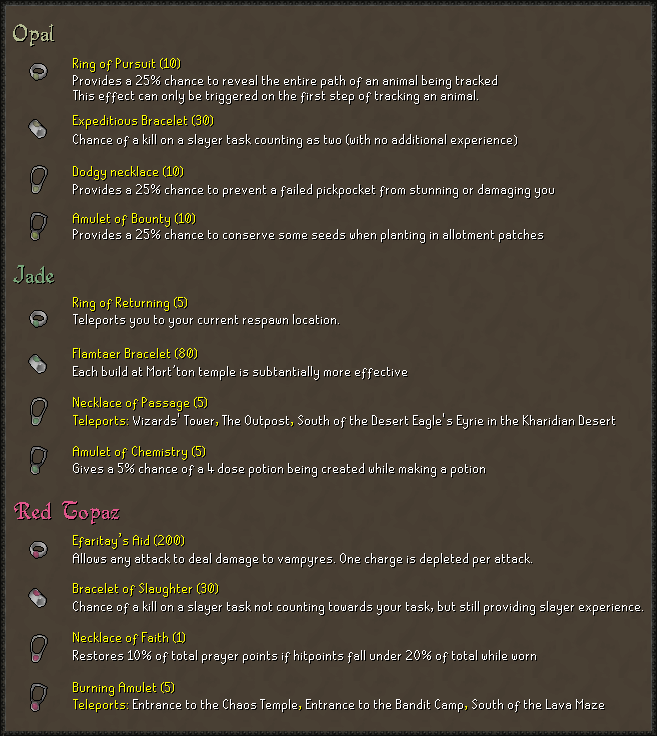 Inspired by a recent suggestion from LoreMasterRS on reddit, we'd like to offer the ability to create a variety of silver jewellery! Silver jewellery would be created in the same way you craft gold jewellery. The only difference would be the use of silver bars instead of gold bars, and the use of semi-precious gems. It will be possible to enchant all different types of gem-holding silver jewellery using the existing enchant spells found on the normal spellbook. Level 1 Enchant for Opal, Level 2 Enchant for Jade and Level 3 Enchant for Red Topaz. Using Opal, Jade or Red Topaz within silver jewellery would offer the following effects when the jewellery is enchanted. Jewellery which provides a chance of an effect being triggered would only use a charge when the effect occurs. The different jewellery able to be crafted out of silver bars and semi-precious gems will be scattered throughout the low to mid levels of Crafting, with the lowest. The experience gained will be just lower than what gold jewellery offers at similar levels. Question: Should it be possible to craft silver jewellery? Silver bars would be used with semi-precious gems (opal, jade, red topaz) to create rings, necklaces and amulets. When enchanted, these pieces of jewellery provide different effects depending on the gem used (see attached image for effect details). The Light Ballista and Heavy Ballista are tricky to balance for both pures and mains simultaneously. We'd like to change what each of these weapons offers to help bring more balance overall. Last week we made a change to the Heavy Ballista to lessen its strength. While this change had the desired effect at lower combat levels, the weapon is no longer as useful for higher level players. We'd like to improve the value of the Heavy Ballista for higher level players once more, while simultaneously bringing a bit more use to the Light Ballista. To Improve the Light Ballista, we would like to improve its stats to match that of the Heavy Ballista as it currently exists in game. This would mean increasing the Ranged attack of the weapon to +110. The Ranged level required to equip the weapon would also be increased to 65, and it would be able to use all types of javelin with the weapon. To improve the Heavy Ballista, we would like to increase its Ranged attack to +125 and its Ranged strength to +15. Alongside this, the weapon would require completion of Monkey Madness II and level 75 Ranged in order to equip it. Most of the problems with the Heavy Ballista were a result of low Defence accounts being able to take advantage of the weapon. By adding the additional requirement for the Heavy Ballista, it allows us to better balance the weapons for both mains and pures simultaneously. Improving the Light Ballista to sit where the Heavy Ballista currently does means that low Defence accounts will still have an effective, hard-hitting Ranged weapon. Question: Should the Light Ballista and Heavy Ballista be re-worked? The Light Ballista would be given +110 Ranged attack and the ability to use all javelins. It would have a higher requirement of 65 Ranged to use. The stats of the Heavy Ballista would be increased to +125 Ranged attack and +15 Ranged Strength. This would come with the additional requirements of 75 Ranged and completion of Monkey Madness II to use. This year's Halloween Event received a fantastic response, and there were many suggestions of it becoming a permanent free-to-play addition to the game. As a new Quest, all players would be able to take on the Killer's deadly riddles and uncover the truth. This Quest would be free-to-play for all players, and have no prerequisites to begin. It's important to note that we would rework the quest slightly to remove mentions of Halloween, and the current cosmetic rewards would remain as time-limited seasonal items. We would replace these rewards with 600 Crafting xp, an uncut Ruby, Emerald and Sapphire, as well as 1 Quest Point. The quest would be started exactly the same as it is now - by speaking to the injured couple in the south of Lumbridge Swamp. Those who had completed the Halloween event would need to complete it again in order to claim its rewards. Question: Should the 2016 Halloween Event be added to Old School as a permanent free-to-play quest? This quest would reward 600 Crafting xp, an uncut Ruby, Emerald and Sapphire, and 1 Quest Point in place of the seasonal rewards. The Seers Ring currently sees significantly less usage than its Melee & Range counterparts, a buff to its Accuracy & Defence would bring it more in line. In order to make the Seers ring more appealing, we would improve its Magic Attack Bonus and Magic Defence by 50%. This would bring it to +6 in both of these stats from +4. We would also apply this 50% increase to its imbued form, meaning an imbued Seers Ring would provide +12 Magic Attack bonus and Magic Defence. 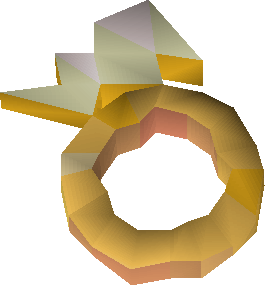 Question: Should Seers Ring have its Magic Attack Bonus and Magic Defence Bonus increased by 50% to +6 in its un-imbued form, and +12 in its imbued form? Question: Currently, some NPCs which you might expect to drop champion scrolls do not. Should champion scrolls be added to the drop tables of these NPCs? Question: When you reach the maximum number of boss or slayer kills Old School can store, the number is simply replaced with 'Lots!' as it cannot get go any higher. Should the number also be displayed alongside this? Question: Should a confirmation message appear when releasing stackable hunter creatures? Question: Should a shortcut be added to the fence next to the Taverly Dungeon Lesser Demons? This shortcut would require level 63 Agility to use. Question: Should it be possible to convert Xeric's Talismans into 100 Lizardman Fangs? Question: The Agility shortcuts found on the way to the Cosmic Altar are currently quite slow due to the number of obstacles you must pass. Should we reduce the number of obstacles in order to speed up these shortcuts? Question: Should the Ring of Coins and Ring of Nature be made usable and tradeable in free-to-play? Question: Should the player-owned house max hit dummy be made to account for the special effect of the Arclight? Question: Should the Magic Imbue spell icon be faded out when it is on cooldown? Question: Should the respawn rate of Scorpia be reduced to 10 seconds? Question: Should Hill Giants located in the Wilderness drop Giant Keys at twice the usual rate? Question: Should the payment required to use the Shilo Village furnace be taken at the furnace itself rather than the door? Question: Should we change all trouble brewing flags to be 1 handed items? Question: Should we add Kurasks to the Relekka Slayer Cave? These would only be killable on task. Question: On the Boss and Slayer kill logs, should each monster also have a Streak counter with a Reset button? The existing counters would be completely unaffected by this, but players would be able to reset their Streak counter on demand to track individual streaks. Question: Magic boosting Prayers currently only affect Magic Attack, should this be changed to also increase Magic Defence? Question: Should we remove the need for Fairy Nuff's Certificate to get to the Fairy Queen after completion of Fairy Tale Pt. 2? Question: Currently your kill count is displayed within the Barrows, should we change this to show your percentage towards maximum potential rewards? Question: Should the Construction skill cape's perk be changed to unlimited POH teleports? Should the Construction skill cape's perk be changed to unlimited POH teleports? Would love the quest to be F2P! If the silver jewelry unenchanted form would be F2P, it'd be a great way to train crafting. Can't say much about others, as have no chance to test them. I mostly say yes to all the questions, however this one is more interesting for me. Question: Should we add Kurasks to the Stronghold Slayer Cave? As with all other creatures in the cave, these would only be killable on task. Yeah, there are a lot of monsters in the Stronghold Slayer Cave so why not. Also, will these be able to cannon or not, cause thats an interesting topic. Despite me being so close to 2.2k, I don't think we need 2 of them. I'd prefer to see a 2.2k total world, and also a 250 quest point world as suggested on Reddit the other day. I think that's probably better imo.